Mr. Ramesh Sharma, was 60 years old when he diagnosed with the Type 1 Diabetes. As he was a fit and healthy man, it was quiet a shocking news for his family member. Considering it as an old age disease, Ramesh began to undergo a classical treatment to control his diabetes. Albeit, he was never been educated by his medical practitioners as to what precautions should be taken to prevent another complications associated with the disease. This unfortunately left him with the severe wound on his right leg! Over the period of time, the small blister on his foot turned into a serious non healing wound! 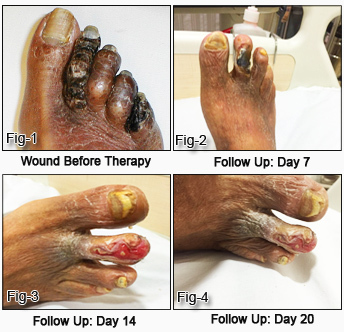 As he was experiencing an advanced case of Diabetic Peripheral Neuropathy; a common side effect of Diabetes. Because of the vascular damage, the flow of blood in the foot was almost restricted. It was thus impossible for his doctors to treat his disease with antibiotics as antibiotics must be carried by the blood stream at the site of injury. So the infected wound festered for months and eventually turned gangrenous.Mr. Sharma visited to many doctors, who expressed almost the same opinion to amputate his toe to spare his life from resultant sepsis. However, Mr. Sharma didn’t want to lose his leg so kept on seeking different opinions. Fig 1:- Diabetic Leg showing black external surface of the wound, illustrating chronic dry gangrene. Fig 2:- The wound appreared to be slightly swollen and reddish due to initiation of acute inflammation, after the PRP treatment. Fig 3:- Complete debridement of the wound observed, indicating removal of dead, necrotic tissue and foreign matter. Fig.4:- The scar appeared to be stretched and contracted implying the initiation of wound maturation by cross linked structure of collagen, epithelization and cellular proliferation.